A group sailing session of 2 hours of social fun relaxed sailing tuition. These sessions are run several times a week at both our Tresco and St. Mary’s base. Each session we will build on and further develop each students sailing skills from beginner upwards. Sailing with other students they will learn quickly, have a lot of fun and make friends. Due to visitors having differing start & finish dates to their holidays it has been difficult for us to run full courses for groups that fit with everyones holiday dates. Students can join as many or as few a sessions as they wish (though places must be booked in advance). While the sessions will cover as much of the RYA syllabus as possible the structure of the sessions will be flexible to reflect the ability of students on the sessions that day. As a result of this it may not be possible to achieve certification as part of these sessions and so if you wish for your child to specifically achieve a certain RYA standard it may be necessary for them to have additional sessions to complete the required parts of the syllabus for certification. RYA certification and log books are not included in these sessions, but are available. 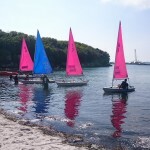 Sail Camps are scheduled on the following days through out summer, though there are some weeks that these may vary.